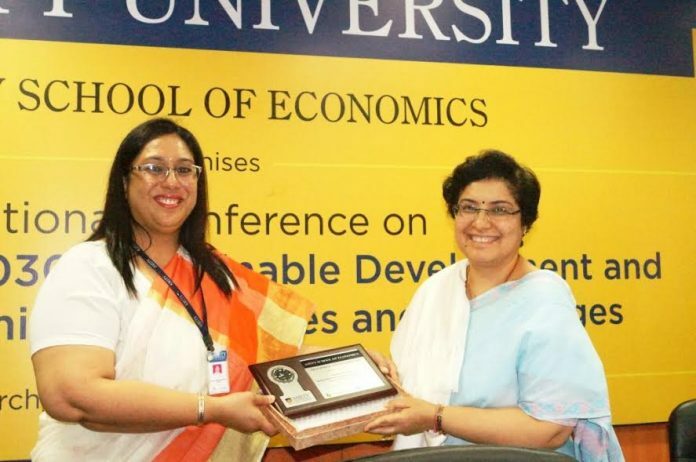 Welcoming the distinguished gathering, Dr. Shalini Sharma, Director, Amity School of Economics highlighted the importance of exploring how sustainable development will help to shape India 2030. She remarked that during the two day Conference, 8 sessions and 2 panel discussions will unfold wherein eminent speakers will share their views and enlighten the students and participants. Dwelling on the objectives of the Conference, Dr. Shalini stated that the Conference aims to generate wide spread awareness about UN’s Sustainable Development goals through a national platform and to motivate budding researchers and economists to understand the intricacies of sustainable development and undertake the challenges of working in this paradigm. Delivering the key note address, Dr. Rajat Kathuria, Director & CE, Indian Council for Research on International Economic Relations stated that India witnessed a golden period of growth and development during last ten years during which over 140 million people have risen above the poverty line. He lamented that despite the speedy growth, the mainstreaming of Sustainable development in economic plans occurred a tad late in India since sectors such as Agriculture, Manufacturing Industry etc. received more importance and urbanization and sustainability were ignored. The dominant narrative, he stressed, has been that developing economies should focus on growth even if, it is at the cost of environment. He remarked that growth is not a two horse race between growth and sustainability and present generation cannot leave behind an environment which is not worth living for coming generations. He stressed that sustainability needs to be mainstreamed in economic policies and there is a gradual move towards the same. Corroborating his view point that “Growth and Sustainability can be achieved at the same time”, Dr. Kathuria stated that there has been Clean Energy cess on the use of coal amounting Rs 400 per tonne, therefore, a bridge needs to be created between coal and renewable energy which could help in greening of primary sources of energy without compromising on profits. He stressed that if resources like coal and energy are properly priced, all other important goals such as poverty alleviation, greening of infrastructure etc. can be achieved easily. Addressing the gathering, Ms. Seema Arora- Executive Director, CII-ITC Centre of Excellence for Sustainable Development thanked Amity for providing an opportunity to CII- ITC Centre of Excellence for Sustainable Development for working with Amity. She stressed that it is very important for the youth of today to understand the importance of sustainable development and how they can contribute towards it. She stated that sustainability is a complex term which is very less understood by most of the mid-level and small scale industries since they are more concerned about present and immediate profits, overlooking the long term benefits of sustainability and its effect on environment. She averred that academic community particularly budding researchers and economists can play a big role in disseminating awareness of sustainability as a mainstream issue. Referring to odd even formula, she remarked that the economic analysis of cost and benefit needs to be done while implementing any decision in the area of sustainability. She opined that the need of the hour is that researchers and economists could initiate evidence based research and policy analysis in partnership with Industry for mainstreaming the issue of sustainability. She invited the youngsters to join the journey initiated by CII-ITC Centre of Excellence for Sustainable Development and contribute towards the cause of sustainability. The Inauguration was followed by Panel discussion on the Theme “Promoting Skills for Sustainable Development” during which Ms. Renu Bajpai, President, USD Consortium of Skill Development, Training & Women Empowerment, Ms. Abha Banerjee, Leadership and Motivational Speaker, General Dr. Arvind Kumar Sharma, IPC India , Mr. Salil Bhatia , CEO, Center For International Education and Scholarships and Ms. Mona Gupta – Adviser, Practitioner & Educator – Sustainability, SDG’s Skills & Human Rights shared their views.